South Indian Bank PO Notification 2019: South Indian Bank is one of the top private sector banks in India. Working at this coveted body is highly prestigious and hence, demanding. Lakhs of students test their lucks and apply for the exams conducted by the bank even after knowing about the handful number of vacancies for the various posts. The bank released the South Indian Bank PO Notification on 4th December 2018 for the recruitment of Probationary Officers (PO) in various branches of South Indian Bank all over India. The date for the online application is 10th December 2018. It is always advisable to go through the South Indian Bank PO Notification before applying for the exam. This article leads you to the essentials of the South Indian Bank PO Notification. Age: The candidate’s age should be less than 25 years as on 31st December 2018. Age for SC/ST candidates is relaxed by 5 years. Nationality: The candidate should be an Indian. Educational Qualification: The candidate needs to have passed 10th, SSLC/12th, HSC and Graduation with a minimum of 60% marks under regular. Step 3: To register application, click on the tab “Click on Register Button” and enter the details. A provisional registration number and password will be generated and displayed on the screen. Note down the credentials for future use. Step 4: In case the candidate is unable to complete the application in a single go, he can save the data entered by clicking on “Save and Continue” tab. Step 5: Before clicking on the “Final Submit Button”, the candidate should go through the whole application to check out for any blunder as no change is possible after submitting the form. Step 6: Recognize your details and save your application by ticking the “I accept the Terms & Conditions and Rules & Regulations” checkbox. Step 7: Click on the “Save and Continue” option. Step 8: Candidates can now proceed to upload their Photo and Signature. Step 9: Click on the “Preview Tab” to preview and validate the application form before “Final Submit”. Step 10: Click on the “Final Submit”. Step 11: Click on the “Payment Tab” and proceed for payment. Step 12: Click on “Submit” button and submit your application form. Online test will be made available to the applicants only in English. There is a negative marking of 0.25 for each wrong answer. Candidates can go forward to the Group Discussion and Personal Interview round after clearing the Online Aptitude Test. The South Indian Bank PO admit card will be released on the official website of South Indian Bank – southindianbank.com. Aspirants can log in to their admit card using their Registration Number and Password (generated during online registration). After the selection, candidates are required to serve a probation period of 2 years as a South Indian Bank Probationary Officer. As we have given you a clear and detailed knowledge of the South Indian Bank PO Notification, we hope you do not face any issue with any of the information. Start your preparation right away so that you can catch up with the flow as the exam date approaches. 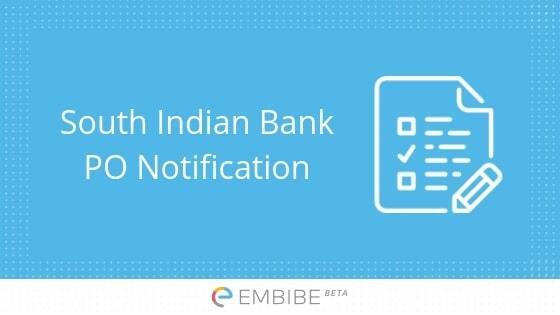 Practising Bank Mock Test Series on Embibe can help you with your preparation ahead. If you face any issue or have any query regarding South Indian Bank PO Notification, you can drop a comment below and we will definitely get back to you. We wish you a very best for the exam in advance. but sir, the last date to apply is 16 December and it is about to come., how can i apply if i dont know the no. of vacancies. We understand your problem. But we do not have the information about the Vacancies yet. The only thing I can do right now is to tell you this year vacancies which was 100 seats. I know but don’t worry, when the vacancies will get released we will immediately update this article. Thanks for appreciating this post. It was nice that I chatted with you.